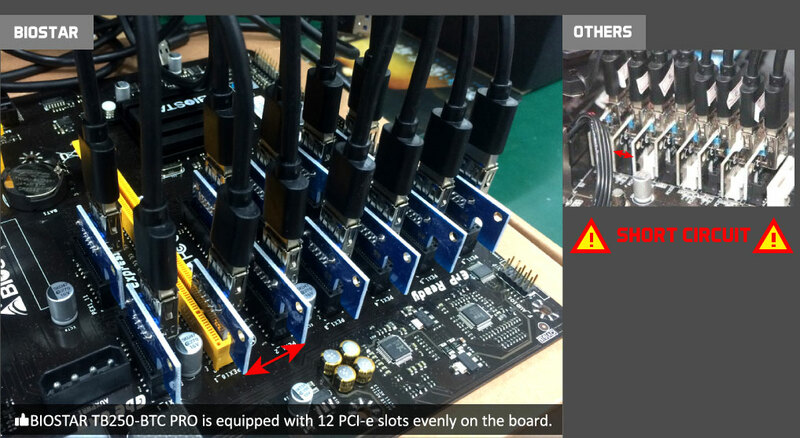 The world's No.1 ultimate crypto mining motherboard, TB250-BTC PRO supporting up to 12 native PCI-e slots with 12 graphics cards, is officially out NOW and available on the worldwide market. Just mining NOW! BIOSTAR brings a whole new crypto mining revolution dawning for the mining market. The cost of a mining system is always such a thing that a miner cares about the most. 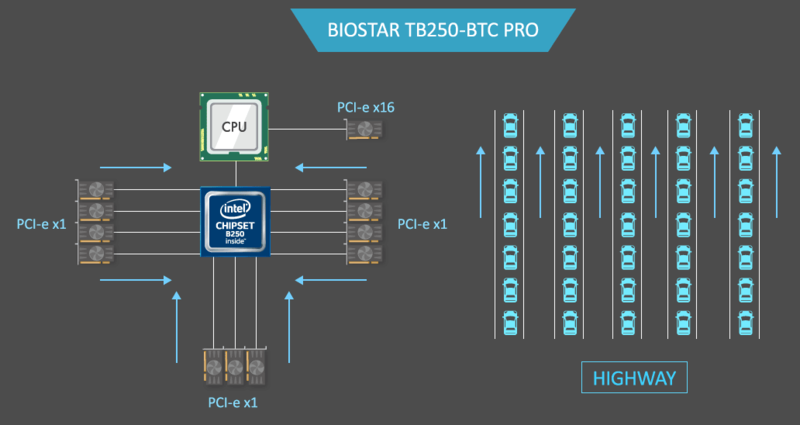 Now BIOSTAR TB250-BTC PRO saves all professional miners' money efficiently and wisely! 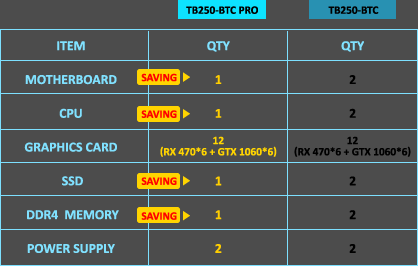 You can build up one crypto mining system with TB250-BTC PRO, loaded up to 12 GPUs to earn even much more profit than that of two systems with the setup of TB250-BTC and 6 GPUs respectively. That is, you may probably save a system cost around up to US$200 on the mining hardware and components. For example, the cost saving includes a CPU, a motherboard, a SSD, a memory card, and other PC peripherals. We do bring the best cost saving solution to all professional mining enthusiasts! Compared to two mining machines with TB250-BTC, one ultimate mining machine with TB250-BTC PRO efficiently boosts the mining performance up to 200% to maximize your profitability and makes you spend much less time getting the highest mining return. TB250-BTC PRO brings 2X faster mining speed to increase much higher hashrate and makes the mining performance most efficient; that is, you can get the best cost of return just in 79 days , which is compared to 97 days for the two sets of TB250-BTC mining machines. We do bring the most bang for a miner's buck and time is money. The more time you save, the more money you get! Note: The ROI may be changed, depending on the fluctuation of crypto exchange rate and hash difficulty. 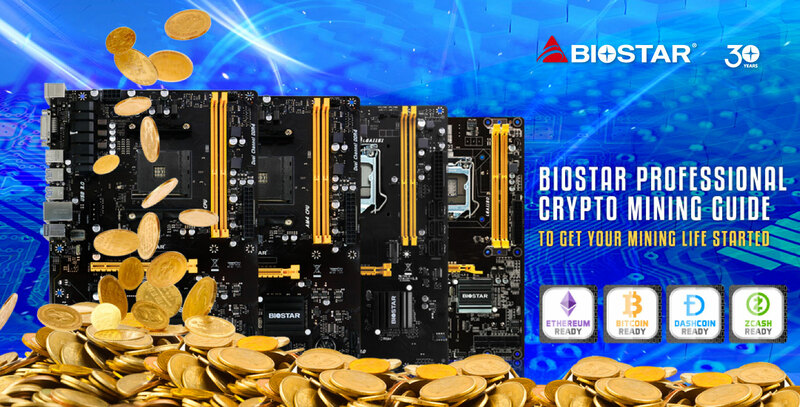 BIOSTAR proudly brings such excellent mining user experience to mining enthusiasts. 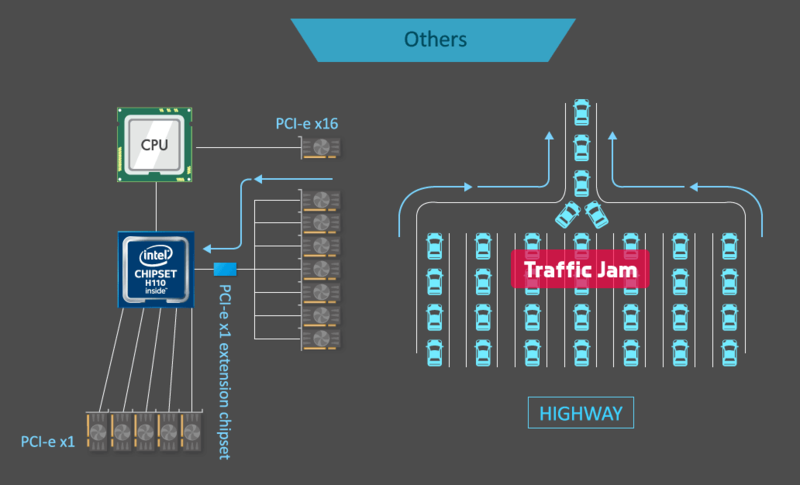 Why are native PCI-e slots so vital to GPU mining? 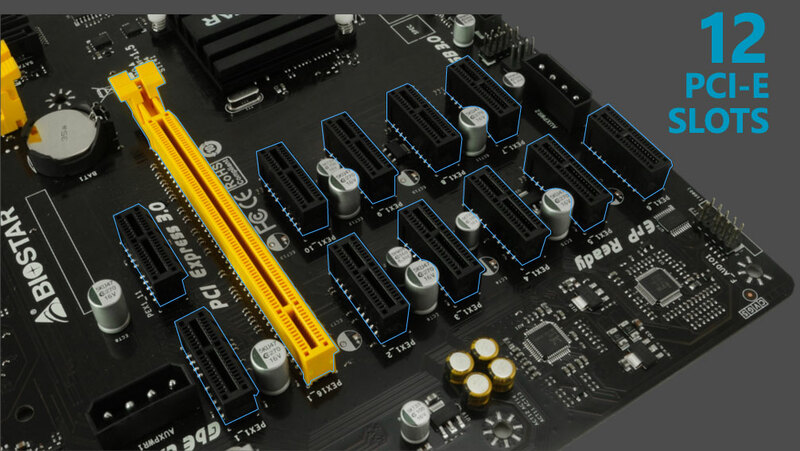 Native PCI-e slots can make the GPUs operating with high stability, high compatibility, and high speed of PCI-e bandwidth. That's why we are so proud to be the first one to launch such kind of dedicated and powerful crypto mining motherboard TB250-BTC PRO onto the crypto mining market. We make a very robust mining base for every miner.